Suicide is a tricky thing. It's almost impossible to understand unless you are or have been in that dark, bleak place struggling to get out. It's hurtful, it's confusing, it's frightening and heartbreaking to know that someone you love could be so torn apart inside that they cannot contemplate continuing to live. To experience suicidal thoughts is overwhelming, terrifying but in a sense peaceful. To know there's a way to escape the pain of the unbearable weight of severe depression is, in a funny way an enormous comfort. I feel like even now, in what we would consider to be a modern and progressive society depression and mental illness in general is massively misunderstood. It's difficult for people to handle because so many people just don't get it. I remember hearing all the time people saying, I don't understand self-harm. How could a person deliberately hurt themselves. This is the wrong question to ask of a sufferer. The same way that "Why would you want to kill yourself?" is the wrong question to ask someone having suicidal thoughts. All it serves to do is highlight a lack of understanding and isolate the sufferer further, trivialising their experience as ridiculous. It can be a very lonely place when you're battling depression. It can feel like the whole world is against you, like you have nowhere to turn to get help. Instead of saying "I don't understand" or "How could you do this" how about practising a little empathy. Empathy can be a difficult concept to grasp. It's not sympathy, which is feeling something on your own, personal terms and often turns out to be pity dressed up. Feeling sorrow for the way someone is feeling in this way is not productive or helpful. Empathy, on the other hand is genuinely recognising the feelings and needs of others, to understand the emotional state another person is experiencing and to appreciate and feel what they're feeling. Often, offering this understanding and appreciation can go a very long way into making someone suffering depression feel more human. Depression is a very lonely illness. People don't know what to say, don't know how to act and unfortunately often adopt the attitude of "Pull yourself together!" which is incredibly unhelpful. Depression is not feeling sad, or feeling down. It's an all encompassing, suffocating and debilitating illness that can be difficult to treat. So reaching out to someone which depression, just being there to support and listen without judgement, without a "fixit" attitude, without actually trying to do anything offers a lifeline to a sufferer who may be feeling ashamed, or alone, or afraid, and could lend the confidence needed for the sufferer to seek professional help. You wouldn't expect someone with diabetes to be able to heal themselves, you wouldn't expect appendicitis to disappear because you will it so. You wouldn't be able to you yourself heal someone suffering from for example, septicaemia by talking with them and telling them what they should do. So why do we behave this way when it comes to depression? Why do we often behave like it's the sufferers fault that this illness has befallen them? The quicker we begin to think of depression along these lines, along the lines of an illness, the better. It's nothing to be embarrassed about, it doesn't signify any kind of failure or hopelessness or uselessness. And it can't be swept under the rug and forgotten about, because it won't just magically disappear. Everyone's life is important and valuable. This may be something huge, or it may be something tiny. But it's something. Some people have bumps in the road to contend with, but no-one is ever a failure. Everyone has something to offer, something to give, something to fight for. It's just incredibly sad that some people can't win their battle. 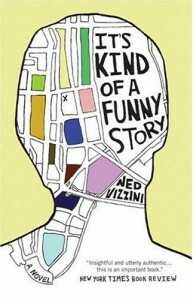 I learned that recently Ned Vizzini sadly lost his life to suicide. I can only hope that he realised how many people he touched before he died. His books focussing on teenaged mental illness have brought so much comfort to so many people, allowing those experiencing these frightening thoughts and feelings to feel not so alone. It's Kind of a Funny Story is the story of Craig Gilner and his decline into depression due to the pressures of growing up, culminating in a five day stay at a mental health facility in New York where he lives. Craig is a believable, relatable and very endearing character suffering beneath the weight to achieve perfection as unfortunately so many teenagers are. If only he and they would realise that it's okay to make mistakes. The universe will always grant a second chance. Perhaps not where you were expecting to find it, perhaps masquerading as something entirely different, but honestly - there's no need to get everything right first time round. Making mistakes is an important part of the learning process. Craig doesn't realise this. He's put so much stress on his shoulders to attend a prestigious school, to impress his friends and parents, to keep up with his course work that he snaps. He frightens himself with his thoughts of suicide and checks himself into the psychiatric unit at the local hospital. The portrayal of his stay, while somewhat long winded is interesting and lively, made all the more so by the cast of colourful characters he meets who show him that life really is worth living, and things may not be as bad as he feared. I enjoyed the romantic aspect of It's Kind of a Funny Story. It was weird and sweet. Sure, there's some jumping to conclusions and some teen angsting but at the end of the day this is a book about hope. It's a book about not being afraid to admit you need help, not being afraid to reach out and connect to other people, not being afraid to make a bad decision because you can always bounce bounce back. It's a book about not being afraid. Don't be afraid to be yourself, don't be afraid to hold your hands up and say you made a mistake, don't be afraid to feel what you've got to feel. Being a teenager is not easy. You spend years in that transition period between being a child and an adult, trying to find your feet, figuring out how you fit into the world. You're told you're too young, then you're told to stop being so childish. It's scary and it's confusing. It's Kind of a Funny Story acknowledges that and says Hey, it's okay. And for that I thank Ned Vizzini. Through all his own hardships he still had the strength to share his wisdom with others. 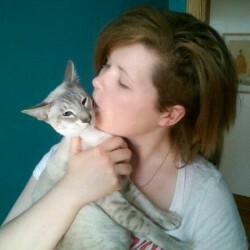 I hope he realised how amazing this is.